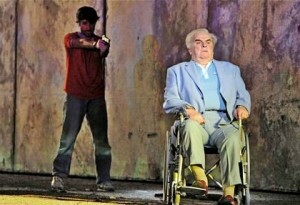 "The Death of Klinghoffer" is NOT Free Speech nor Art. The demonstration against the Klinghoffer Opera in New York yesterday was excellent, but many Jewish organizations are not responding and when they do their response is weak. It is incitement which can and will encourage more acts of terrorism against Israel and Jews worldwide. 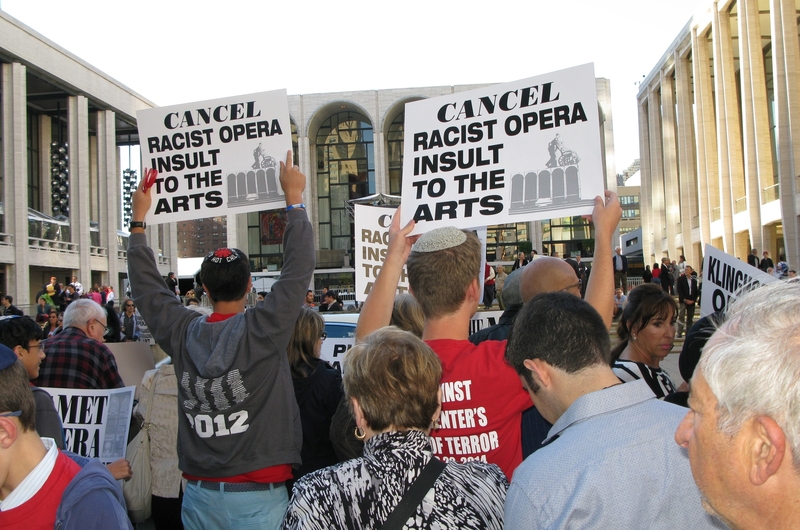 New York — October 20, 2014 … Over four thousand Jews and Christians turned out for a demonstration today against the opening of “The Death of Klinghoffer” Opera at New York’s Lincoln Center. Former New York Mayor Rudy Giuliani led a press conference followed by a demonstration outside of the opening of “The Death of Klinghoffer” which premiered at the Metropolitan Opera at Lincoln Center on Monday evening, October 20 at 5:00 PM. Additional participants included Congressman Peter King, Former NY Governor David Paterson, Criminal Defense Attorney Ben Brafman, Queens Borough President Melinda Katz, and Rabbi Joseph Potasnik. 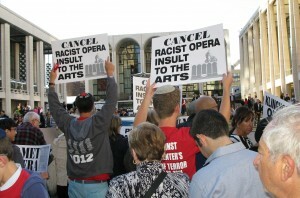 Following the press conference, a coalition of organizations gathered, as thousands raised a voice of outrage against this opera which promotes terrorism and anti-Semitism. Rabbi Avi Weiss and a group of Rabbinical leaders held a fast and prayer and vigil across from the Met beginning at 12:00 PM in memory of Leon Klinghoffer’s soul, being desecrated by the opera. There was a press conference at Lincoln Center on Monday evening, October 20th at 5:00 PM, across the street from the Lincoln Center Plaza at Broadway & 65th Street to protest the first evening that “The Death of Klinghoffer” will be shown at the Metropolitan Opera.